Armenia is looking to achieve good results during the first major basketball tournament on the level of national teams to be held in the country later this month, according to local basketball officials. Besides the host nation, the other teams at Women’s European Division C Championships (to be held at Mika Gym in Yerevan from June 28 to July 3) will be Andorra, Moldova and Gibraltar (involved in Group A with Armenia) as well as Wales, Scotland and Malta in Group B. (Azerbaijan has refused to come to Yerevan). 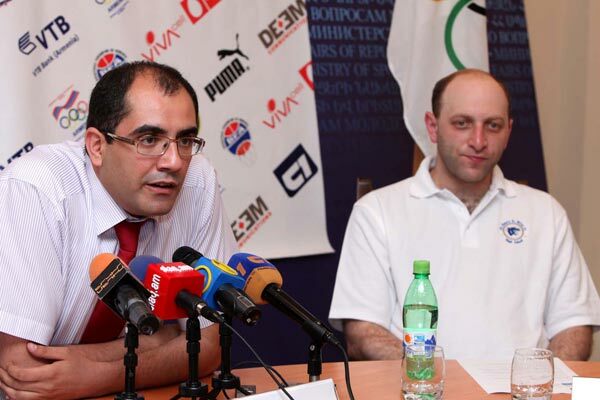 “Our goal is to reach the final,” said Gia Ghazanchyan, the Armenian team’s head coach, at a press conference last week. Under Ghazanchyan’s management Armenia’s leading basketball club Hatis managed to reach the playoff stage in the 2009-2010 season’s European Cup. It was the successful performance of the revived Armenian club that influenced the decision of the game’s international governing body, FIBA, to pick Yerevan as a venue for the championships. While Hatis mostly used the services of international players, it is local talent that national teams have to rely on. According to Armenian Basketball Federation President Hrachya Rostomyan, the budget of the tournament in Yerevan will be 50-55 million drams (up to $145,000) to be allocated from the European Basketball Federation (FIBA Europe), the Armenian government and the National Olympic Committee of Armenia. Only two best teams in Division C are promoted to Group B. Armenia currently has no ranking on the FIBA’s 69-nation list topped by the USA, Russia and Australia.